To help Montclair State continue on its path of excellence — supporting promising students with scholarships; providing resources for groundbreaking research; and maintaining our vibrant campus community — we ask you to join us. Gifts of all sizes provide the funding for Montclair State to soar to new heights. 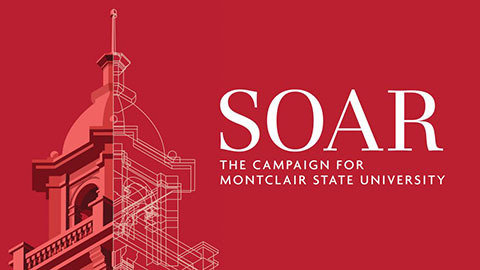 Every gift helps Soar, The Campaign for Montclair State University, to advance our students and our future. Your annual support, a gift to The Fund for Montclair State, or any designation you choose, will be counted to help us reach our goal. Select the amount and the fund for which you wish to make a gift. You may select your school/college or designate your gift for a scholarship, a specific department, institute or center, or even split your gift across multiple funds.